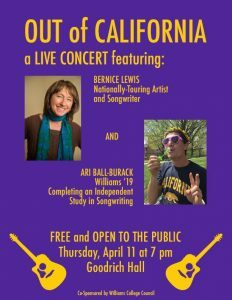 Singer/Songwriter Bernice Lewis & eph student Ari Ball-Burack ’19 perform on Thursday, April 11, 7:00pm at Goodrich Hall on Williams campus. FREE & open to the public. WilliNet is a platform for grassroots democracy and community engagement.